← HAVE YOU HEARD OF THE ALCATRAZ EEL? Next week at Maine Crime Writers there will be posts by Susan Vaughan (Monday), John Clark (Tuesday), Kate Flora (Wednesday), Dorothy Cannell (Thursday), and Chris Holm (Friday). 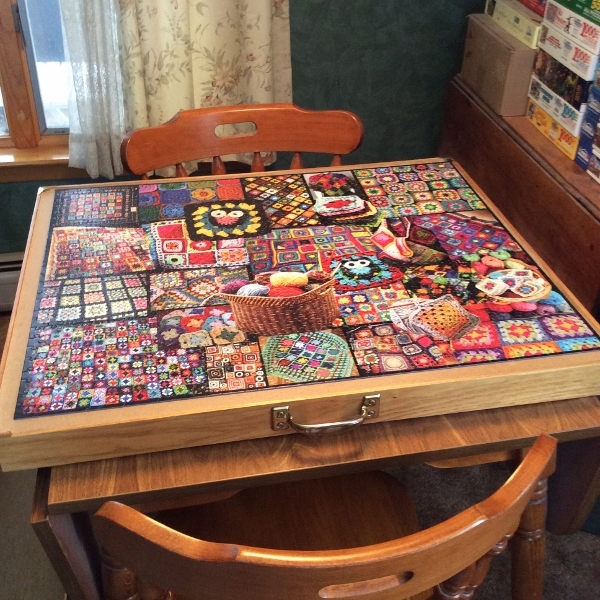 From Kaitlyn Dunnett/Kathy Lynn Emerson: In keeping with my blog last month on Jigsaw Puzzle Therapy I’ve finished another jigsaw puzzle. And I’m almost finished with the rough (very very rough) draft of the third Mistress Jaffrey Mystery. Then all I’ll have to do is make sense of the plot, fix all the continuity problems, make sure my characters are behaving in a rational manner, correct the thirty gazillion typos and misspellings, and delete all the repetitious and unnecessary words. And, oh yes, think up a title. Wish me luck. This entry was posted in Sunday Updates and tagged Chris Holm, Dorothy Cannell, John Clark, Kate Flora, Maine Crime Writers news, Susan Vaughan. Bookmark the permalink. No doubt you can get that all done this weekend! Good luck! Thanks for the vote of confidence, Karen. So far, so good.